While Nann Nann’s work, like that of many Burmese contemporary artists, is deeply influenced by Buddhism, her style is unique. She expresses her feelings about religion and spirituality in a series of elegant, abstract paintings that are visually striking because of her incorporation of gold leaf. These creations are her homage to the devotional aspect of Buddhism, whereby offerings are made by sticking squares of gold leaf onto pagodas and Buddha images. Nann Nann is also inspired by the humble pot. She has always appreciated both the beauty and function of pots, finding a trip to Japan where the ceramic art is highly developed, a revelatory experience. Many of her paintings feature stylized pots or jars – their beauty and simplicity making a radiant envelope for the gold leaf squares amassed inside. Born to artist parents, Nann Nann studied fine art and sculpture in Burma’s capital Yangon. She has not only had many solo and group shows in Burma but also participated in several art shows in the United States, Thailand and Hong Kong. Next to her career as a professional artist, Nann Nann has always taught art to children. She says “I don’t teach the children, I learn from the children”, and indeed her work often has a child-like simplicity, images stripped down to their bare essentials juxtaposed artfully in support of her narrative. 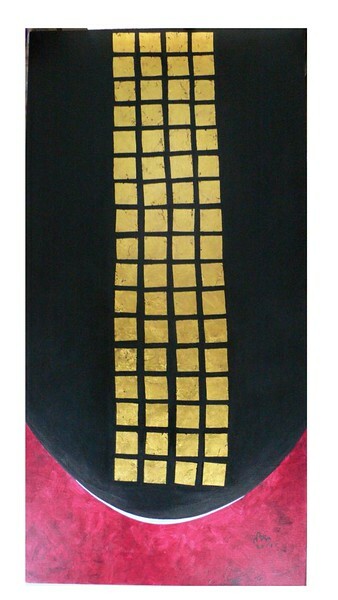 Nann Nann, Peaceful (2), gold leaf and acrylic on canvas, 24 X 48 in.